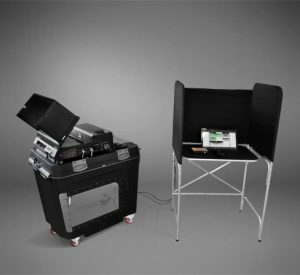 With scant protest, Contra Costa County Supervisors unanimously approved Contra Costa County Clerk-Recorder Joe Canciamilla’s request Tuesday to replace the county’s aging ES&S voting system with a system made by Dominion Democracy Voting Systems, Inc. Courtesy of Dominion Democracy Voting Systems, Inc. The new voting system, the Democracy Suite System made by Dominion will be delivered in time for the special March election for the East Contra Costa Fire Protection District and will be widely put into service for the June gubernatorial election, Canciamilla said. The county has used the ES&S voting system since 2005. Supervisors, particularly Chairperson Karen Mitchoff and District 4 Supervisor Candace Andersen, said they had received several emails from citizens questioning the fiscal validity of acquiring a new voting system in an era of election system security vulnerability. Andersen wanted to know why the county did not put out a request for proposal (RFP), and Scott Konopasek, assistant county registrar, answered that the Secretary of State has to certify voting equipment suppliers. There are few voting equipment suppliers that meet rigid state requirements. It happens that both Dominion Democracy Voting Systems and ES&S are voting equipment suppliers the Secretary of State has certified and an RFP is unnecessary. But in the county’s evaluation, Dominion Democracy took top honors, said Konopasek. In evaluating the Dominion Democracy and ES&S systems, Dominion Democracy came out on top with a score of 39 points out of 60 possible points. Dominion Democracy scored highest, especially in the areas of integrated software, ballot marking device, central count equipment and precinct count system. ES&S did not prevail in any of the 11 evaluation categories. Canciamilla told supervisors that the Office of the Clerk-Recorder has $4.7 million to pay Dominion Democracy Voting Systems. Beginning in the second year of the contract, the office will pay $360,000 a year for six years to cover maintenance and licensing costs, Konopasek explained. Canciamilla said the current ES&S system is rapidly deteriorating to the point that it needs to be replaced, especially now that elections will need to accommodate three languages: English, Spanish, and, starting this year, Chinese. Furthermore, ballots are bulkier with more ballot measures. In this era of national inquiry about Russian meddling in our elections, Konospasek said the Dominion Democracy Voting Systems passes the cyber security test. Supervisor Diane Burgis of Brentwood questioned the vulnerability of the Dominion Democracy Voting System to cyber security threats. Voters will see no difference. They will continue to receive and fill-in-the-bubble ballots that will be tabulated by digital imaging. Poll workers will also see no difference with the new voting machines. Before supervisors voted on the request to acquire the Dominion Democracy system, Canciamilla informed supervisors that he plans to eventually present a request to the board for the county to spend about $14 million to restore 3 million historic documents and 20 million maps that are now housed in inadequate storage. Canciamilla did not state when he will present this request or how he plans to fund the request. “We are excited to be bringing in this new equipment that will make our operation more cost effective and reliable and ensure a secure, accessible and transparent process,” said Canciamilla. At the request of District 3 Supervisor Diane Burgis of Brentwood, supervisors voted 5-0 to authorize the Conservation and Development Department to conduct meetings with farmers and residents with agricultural interests to assist the county in a policy review and the creation of new ideas to promote an “incentive” for agricultural sustainability and economic vitality in Contra Costa County. The county has $150,000 to spend on agricultural planning, John Kopchick, chief of the Contra Costa County Department of Conservation and Development told supervisors. He suggested that the department conduct a series of forums where 15 to 20 persons per forum can express ideas ranging from agricultural tourism to bed and breakfast establishments. “How does cannabis get involved in this?” asked Board Chairperson Mitchoff. “Cannabis is a background topic,” answered Kopchiick because the county does not yet have a marijuana ordinance on the books. The department plans to conduct its first forum in April. 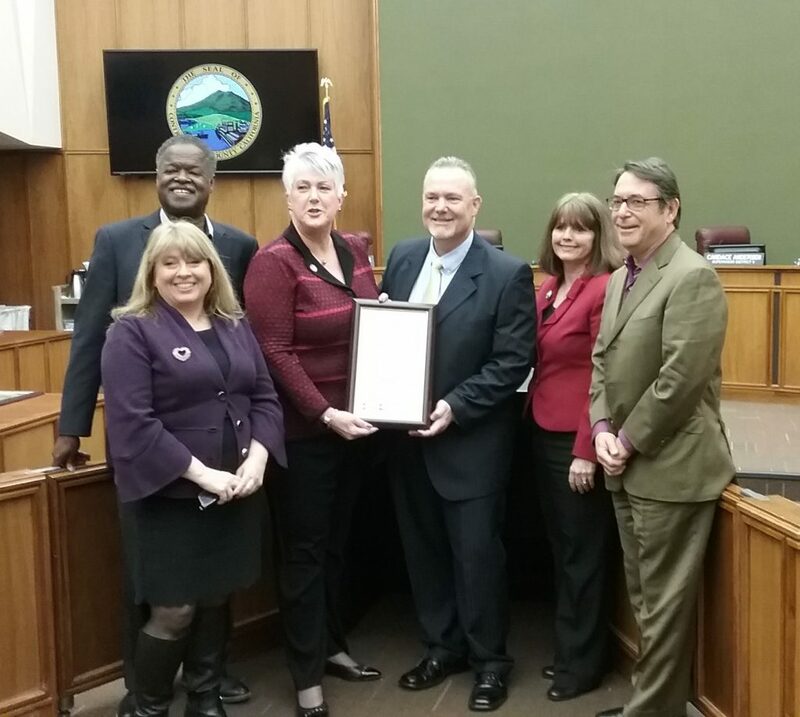 The Supervisors also gave special recognition to the county’s elected Auditor-Controller Robert Campbell for his 30 years of service to the county on Tuesday. This entry was posted on Wednesday, February 14th, 2018 at 11:25 am and is filed under News, Politics & Elections, Contra Costa County. You can follow any responses to this entry through the RSS 2.0 feed. You can leave a response, or trackback from your own site.